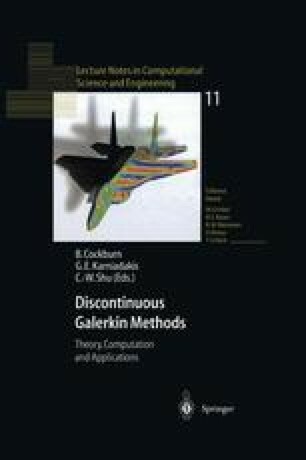 We develop software tools for the solution of conservation laws using parallel adaptive discontinuous Galerkin methods. In particular, the Rensselaer Partition Model (RPM) provides parallel mesh structures within an adaptive framework to solve the Euler equations of compressible flow by a discontinuous Galerkin method (LOCO). Results are presented for a Rayleigh-Taylor flow instability for computations performed on 128 processors of an IBM SP computer. In addition to managing the distributed data and maintaining a load balance, RPM provides information about the parallel environment that can be used to tailor partitions to a specific computational environment. A. Malagoli. http://www.flash.uchicago.edu/scientific.htm URL, 1997.